Simplify the process of selecting the right insurance plan based on personal demographic data. The Perfect Fit Finder is part of a larger online shopping experience tied to an employers benefits package they build online. The fit finder is the employee's segment of the process where they can select from a variety of plans, however, the fit finder narrows the selection down to “Your Perfect Fit”, “Lower Cost Plans” or “Richer Benefits”. The user always has the option to see all available plans if they don’t like the selected insurance plans. Adding a “Teams” concept to a functioning crowdfunding platform. Collect the user’s data as an individual fundraiser while offering options to join or create a team. Have the user signup to become an individual fundraiser and allow them to opt out of the team module. If the user chose the team path participants would have the ability to customized their own team page, displaying their photo and fundraising totals. Engage the user through gamification at various achievement levels based on their fundraising efforts. Sketch files, mind mapping, swim lane UML charts, Balsamiq wireframe and flow charts. Process flows outline the user's journey and highlight possible pain points the user might experience. They also reveal functional requirements that might not have been mentioned in the discovery phase. 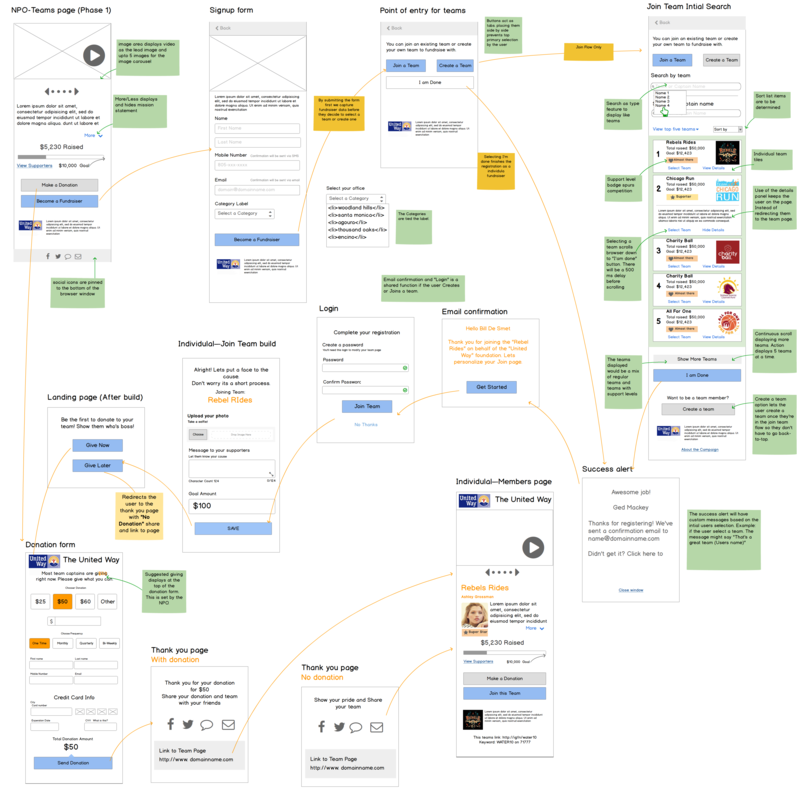 Below are a collection of process flows and site maps from various projects. Observing a high drop off rate when users landed on the browse plans page in the list view. Only 27.45% of the users are staying on the browse page then exit. Test Objective: Is the compare functionality being overlooked? Could this be one of the reasons for the drop off rate on the plan listing page? Test Objective: Solicit feedback from the user on research habits. Find pain points before they journey to the create account page. In-person interviews were used to gather data through participant observations as the user interacted with the sonicelectronix.com website. This provided context for site improvements and unveiled consumer pain points as they journey through the purchasing funnel. 1. Participants filled out an online survey via Google Forms using an iPad. To qualify for the survey participants had to have bought audio products online. 2. Each participant was given three task to perform within a 60 minute period. Each task focused on different scenarios. Quicktime was used for screen recordings to capture the user's journey through the task while recording their thought process along the way. The study concluded after a clear repetition started to appear from the users. The qualitative data was collected and mapped by tasks after reviewing my notes and video recordings of each user. After review, I documented the suggested website improvements that helped increase conversion.